Institutional – B-D Construction, Inc.
Construction on this project included a 135 male and female county jail on an eight acre site in an industrial park in Columbus, Nebraska. This full service jail includes a state-of-the-art video arraignment hearing room to allow for neighboring counties to have judicial access to inmates held in the facility. 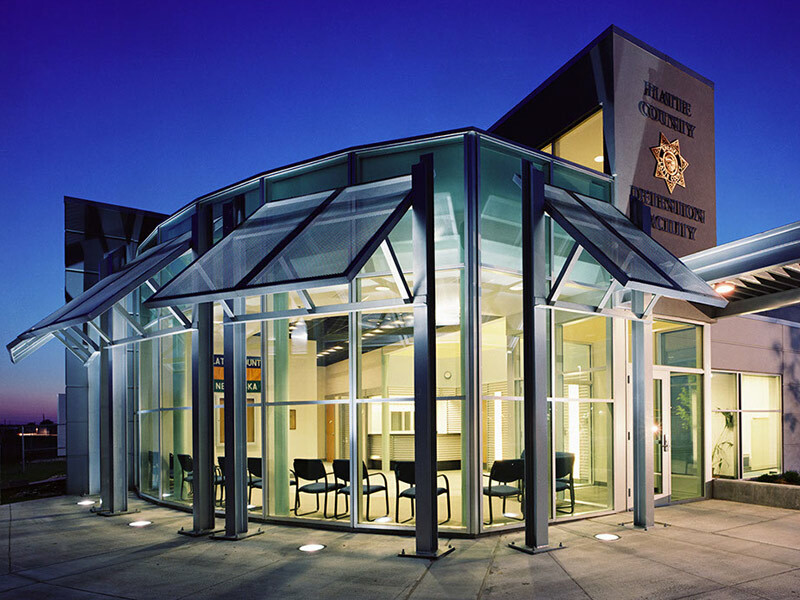 The county detention facility is a full-service, self-contained county jail including jail administration, intake and processing, work real capabilities, public lobby, visitation, hearing room, laundry facilities, food service, program and counseling areas, indoor and outdoor recreation, maintenance, and storage areas. This highly energy-efficient facility features a geothermal heating and cooling system which utilizes the constant temperature within the earth to help reduce energy cost. Innovative use of daylighting was carefully incorporated into the design. Supply and abundance of natural light provided a normalized environment and to reduce lighting loads.